I was recently travelling to NYC, while I was there I visited Strand, a 90 year old, three story legendary book store in Manhattan. I was overwhelmed by the sheer number of books, obviously I was looking for something in history or mystery. So I reached out to the store assistant and asked him if he could suggest me something on the middle east crisis, as I have been wanting to read up on it since a very long time, that is when the gentleman handed me: ISIS, inside the army of terror. In the beginning of our story Iraq was ruled by Saddam Hussein, a brutal military dictator who ruled with an iron fist and was known for his genocidal tendencies. Anyone who opposed his tyrannical rule was put to death. The Kurds were to him what Jews were to Hitler. Enter USA, after 9/11 the Bush administration got an opportune pretext to invade and destroy the Saddam regime. Saddam was captured and hanged, but the invasion of the great serpent(USA, as referred by Jihadis and all Muslims alike) in Muslims land was a source of great trepidation and opportunity for many Islamic terror groups. One of them was the Jordanian terrorist called Al Zarqawi, also the founding father of the ISIS. Al Zarqawi traveled to Afghanistan and Pakistan during the Soviet occupation of Afghanistan, after his return he was imprisoned by the Jordanian government in 1992. It was during his time in confinement that Zarqawi became radicalized and formed his own coterie to overthrow the Jordanian rulers. We see this as a recurring theme in the book some misguided albeit budding terrorist gets locked up in Jail either by Jordanian, Americans, Egyptians or Iraqis and he comes out as a full blown Jihadist, wiling to even murder fellow believers. Zarqawi went on to ally with Al Qaeda, he was even declared their Emir in Iraq. A Brutal man who had a known hatred for Shias, targeted them with the same ferocity as was reserved for the Americans. VBIED, was the weapon of choice for Zarqawi's group and they used it devastatingly. Zarqawi was eventually killed in 2006 by the American forces, but the damage had already been done and an organization was already in place. When in 2015 Abu Bakr Al Baghdadi announced the caliphate and then the eventual capture of large swathes of land in both Iraq and Syria many people were left stupefied by the incredible rise of ISIS in a very short span of time, but to observers and SMEs on the Middle East, rise of ISIS was neither quick nor without help. 1) Isolation of the leftover Saddam regime by US and the new Iraqi regime. The Baathist eventually joined and helped in the rise of the ISIS as mostly they were out of jobs and were targeted by the new regime. 2) The new Iraqi regime led my Al-Maliki was Shia dominated and targeted Sunnis, which was diametrically opposite to what had happened under Saddam who targeted Shias. When ISIS a sunni based terror group started flourishing it was supported by the Sunnis. 3) Mismanagement by the Americans, who knew little about the people, dynamics and corruption that would eventually bring the invasion to an abject failure. Americans have become experts at miscalculation and harboring all weather friends be it in Iraq, Pakistan, Afghanistan or Saudi Arabia. The American occupation is of course seen by Muslims as the return of the crusades in the holy lands and thus their presence greatly exacerbates an already worse situation. 4) Bashar al-Assad, dictator for Iraq's neighbor Syria. When the Arab spring started in 2011. Many people participated peacefully to ouster the Assad dynasty. Assad reciprocated with what he knows best, he crushed the protesters brutally, which sparked violent protests throughout the country and a rebellion against his regime followed. Assad started to crack down more severely, even going to the extent of using chemical weapons against his own people. Assad has had great pressure on him from the West to stop the genocide of his own people and west wants to force his regime out. Assad in turn has raged a proxy war in Iraq through ISIS by allowing the borders between Syria and Iraq to be porous so as to allow entry of foreign fighters in Iraq. I have over simplified this problem on account of space and time constraint but the book nicely explains this precarious situation with Assad. Assad has got ample help from Iran! who has also helped in exacerbating the situation in Iraq. 5) History, brutality and propaganda of ISIS - ISIS is known in the parts were it rules as an able administrator. ISIS provides crime free areas to work and pray. On top of that they are able to improve infrastructure, unlike the US and Maliki government they understand the importance of tribes and assimilated them in their organizations, those who resist are brutally beheaded. The authors also go into detail of how Al Qaeda split from ISIS on account of the latter being too aggressive and Bin Laden's death further weakening Al Qaeda. 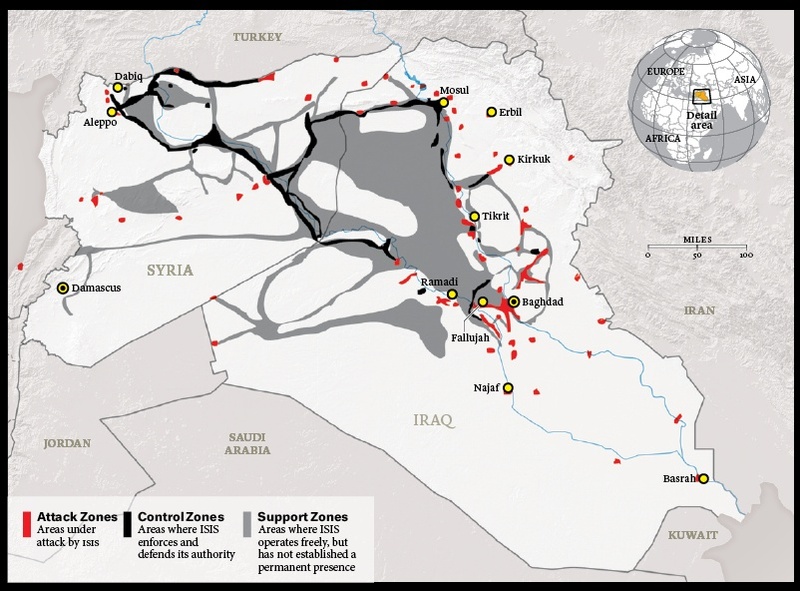 ISIS controls large swathes of land, which also means that they have control over Oil. Selling this Oil in the black market gives them revenue to drive their propaganda and finance terror activities. This propaganda and terror activities in turn generate more funds and more recruits. ISIS has killed scores of innocent people in it's wake, utterly destroying anyone who is not a devout Sunni Muslim. Their brutal, monstrous acts put them in the same league of murderers, rapists and genocidal maniacs as the Nazis, Yahya Khan's Pakistan army in Bangladesh and Stalin's Russian communists. Excellent Introduction to the Middle East and ISIS by the authors.